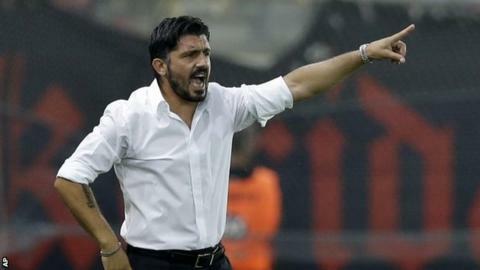 Former Italy midfielder Gennaro Gattuso has changed his mind over his decision to quit as OFI Crete boss. The 36-year-old announced he would be leaving the Greek top-flight club after a 3-2 loss at home to Asteras Tripolis on Sunday. The defeat left Crete with nine points from the seven games Gattuso had presided over. But he has performed a U-turn after talks with the club's administration and a show of support from fans. "After many hours of discussions with members of the board and with the organised supporter groups of OFI, and after the love I have been shown generally by the city of Heraklio, I have decided to take a step back and make a new start," Gattuso told the club's official website. "I want to start from the beginning again and the aim is for us to be stronger and more united than ever." Gattuso was sacked by Swiss club Sion in May 2013 after 11 league games, and fired by Italian second-tier club Palermo that September after six Serie B games. Before his change of heart to stay with Crete, he said: "The players don't believe in me." The former AC Milan player and 2006 World Cup winner had also said: "I have put all my passion and all my strength into this team but I can't be the one solving all the club's problems every day. "I'm not the president and my job should only be football. I feel very upset but I cannot continue."